Hopscotch is a block-programming app that teaches elementary and middle school students coding concepts through the design and creation of games. The app home page features hundreds of games created by Hopscotchers. A simple interface allows users to search for and play games and create and publish games, animations, and art projects. Clicking the plus sign in the iPad app opens the creation menu which offers more than 40 project ideas. Embedded video tutorials in each project guide students through the sequence and logic of creating code to complete a task. For example, in the Snowflake project, the tutorial explains how a snowflake can be created through a series of commands. Users are then guided step-by-step through the process of dragging and dropping commands in the block-programming editor. Explanations of what each command will do help users understand concepts such as values, loops, and events. Students new to programming will gain foundational coding skills as they create projects using the guidance of the videos. Even students familiar with block programming can gain a better understanding of the logic involved in coding through the use of Hopscotch. While the video tutorials are well-made and helpful, the options in the command menus do not always match the commands mentioned in the videos. For example, a video might tell the user to select the “Leave a trail” block, but the block available is “Draw a trail.” Students new to coding might find this small discrepancy confusing or misleading. Hopscotch is available for iPad and iPhone and is free to download with in-app purchases. The Hopscotch for Schools app (iPad only) is $9.99 and allows teachers to create class groups, providing a level of privacy for publishing and sharing. 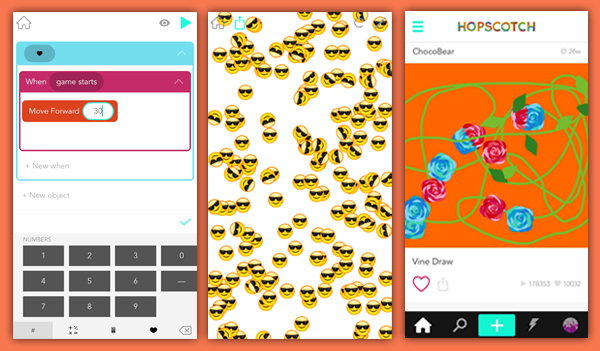 The iPhone app, which previously allowed only Hopscotchers to play games, has recently been updated with the added capability of creating projects directly on the iPhone. While the interface is similar to the iPad app, notably missing is the menu of project suggestions and in-app video tutorials. Without the videos, students unfamiliar with Hopscotch and block programming might need additional guidance and help to create projects in the iPhone app. Educators looking for a beginner coding app should add Hopscotch to their toolbox. Hopscotch’s YouTube channel includes dozens of tutorial videos, while an activity guide and curriculum help teachers incorporate fundamental concepts and terminology into computer science lessons. With an easy-to-use interface and limitless possibilities for game and animation creation, Hopscotch provides a foundation for students to develop coding skills.